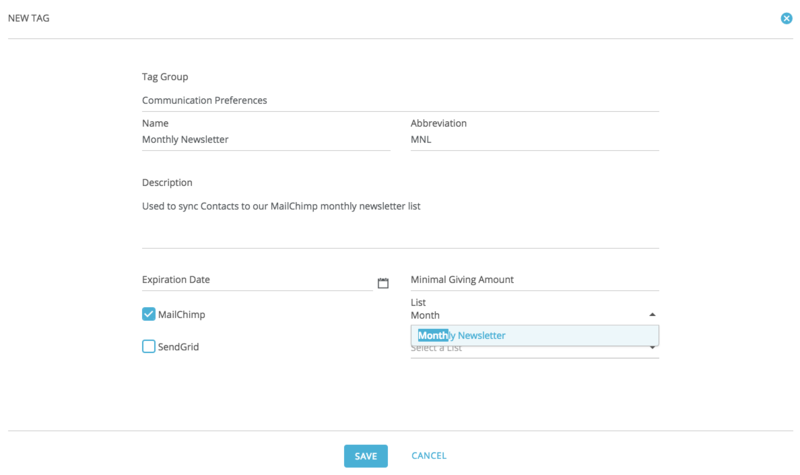 How do I Configure MailChimp Integration? 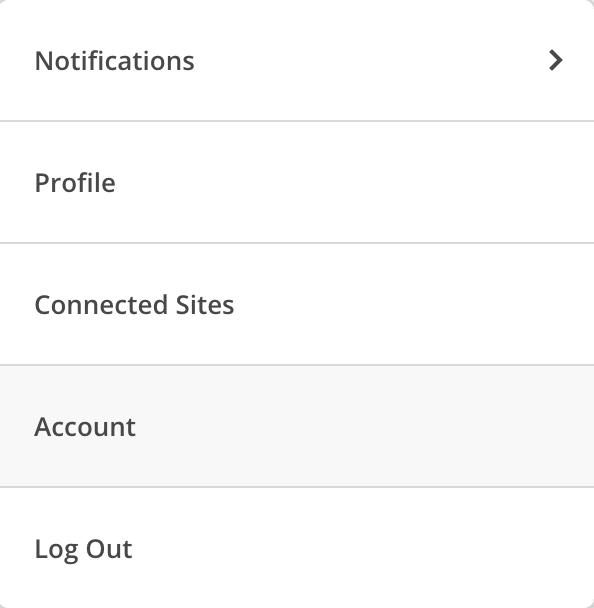 The Virtuous MailChimp sync feature allows users to connect Tags in Virtuous with Lists in MailChimp, which will enable data to be synced in both directions between the two systems. When someone is added to a List in MailChimp, the corresponding Contact record in Virtuous will be automatically tagged as part of that list. If the Contact does not exist in Virtuous, then users will have the option to create a new Contact via the Gift and Contact Import. 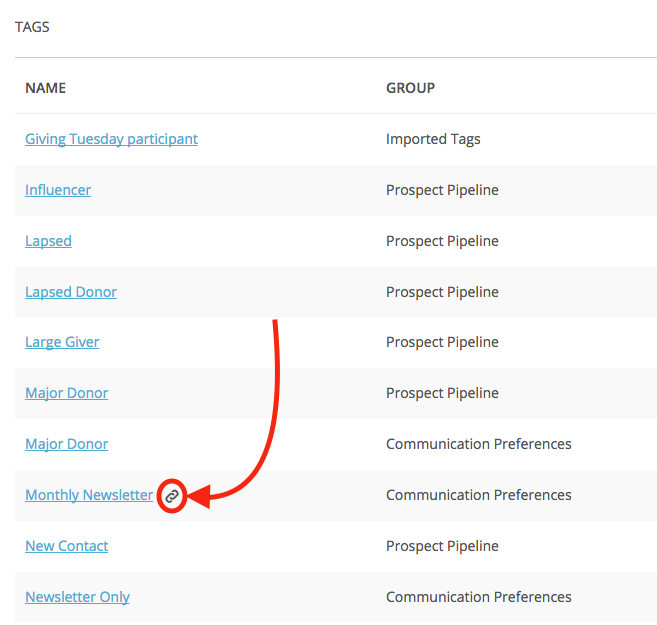 And Tagging Virtuous Contacts with any synced Tag will automatically add them to the corresponding List in MailChimp. First, log in to MailChimp. Click on your username in the upper-right and select Account. Then, on the Account screen, select the "Extras" menu and click on "API Keys." Click on the "Create a Key" button. You can choose to label the new key "Virtuous," if you like. Then, copy that API Key. Look for the blue "Add an Integration" button and click to bring up the New Integration dialog box and then select "MailChimp Synchronization" as the Integration Type. Paste in the API key from MailChimp. You can enter a description, if desired. If you would like to allow MailChimp to create new Contacts, then be sure the check the "Import New Contacts" box. This is especially useful for organizations using MailChimp webforms to collect newsletter signups. With the "Import New Contacts" option selected, all new names will be added to Virtuous. 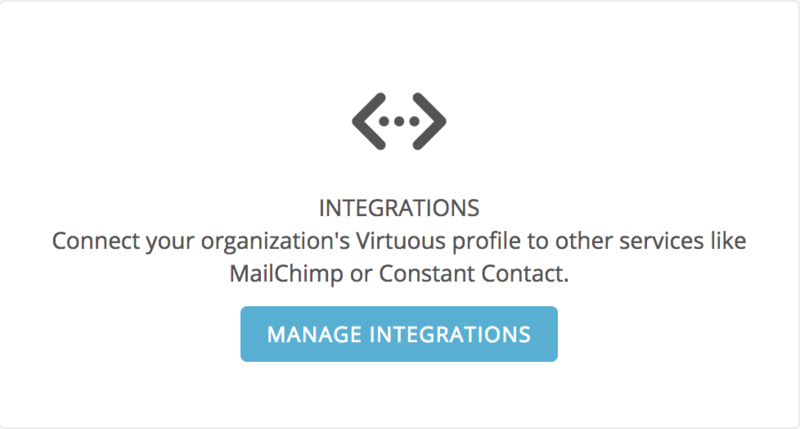 Click "Save" and then you'll see the MailChimp integration listed on the Integrations screen. Make sure that the integrations shows as "Enabled." 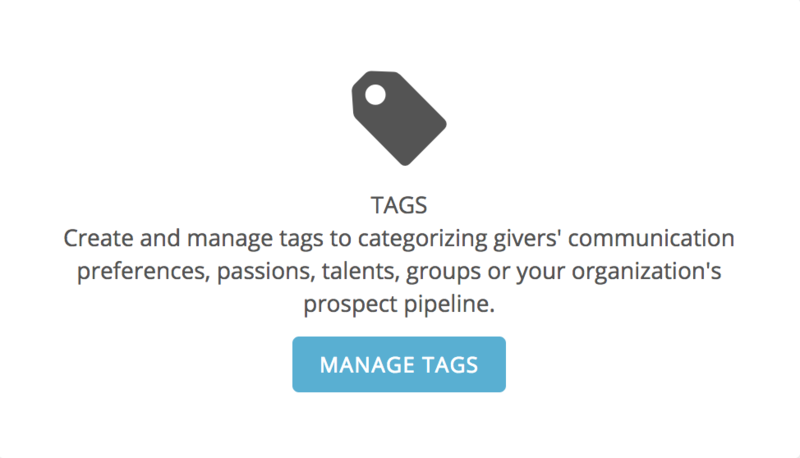 With the integration activated, it's time to start syncing Tags. In order for the Tag sync feature to work correctly, be sure to link each Tag in Virtuous to a different list in MailChimp. The Tag sync feature is not designed to sync multiple Tags to a single list. From the Configuration screen, select the Data Management tab and click on Manage Tags. Look for the edit icon to the right of the Tag you'd like to sync, or click the button in the upper right to create a new Tag. On the Tag dialog, you'll see a checkbox to sync the Tag to MailChimp. Click on the List field and begin typing the name of the MailChimp list to be synced. A drop-down list will populate showing the names of MailChimp lists that match and text entered. Select the correct list and then click Save. The synced Tag will now show with a link symbol when viewing the Tag list. 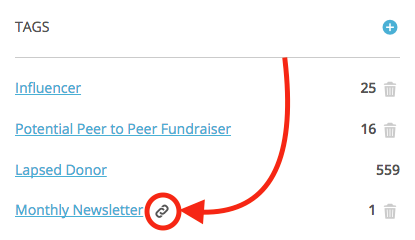 Any Contacts with the synced Tag will automatically be added to the corresponding list in MailChimp. Adding the synced tag to a Contact record will add that Contact to the synced list. And adding a new recipient to the list in MailChimp will add the corresponding Tag to a Contact in Virtuous. When viewing a Contact record, synced Tags will also be identified with the link icon. If a recipient unsubscribes from a specific MailChimp list, the Tag will be removed from that Contact in Virtuous. Re-adding the same Tag will not cause someone to be added back to the list, as the unsubscribe will prevent and list addition in MailChimp. However, the Tag will remain in Virtuous.